It’s that time of year, and without pressing too much, I would like to point you to the links in my right sidebar for paperback and several sources of ebook versions of my book. It’s a fun and relatable story about a 6th grader named Felix who begins to be picked on at school, tries to handle it himself, discovers something amazing and the support of his friends, family and dog, which all lead him to overcome his bully. So far, by reviews on Goodreads, and at Lulu.com, people really seem to be enjoying it, There is still time to squeeze it under another kid or teacher’s tree! Here we go, Thanksgiving is winding up to be a big event in my house this year, I think the number of guests is up to sixteen! Meanwhile, it’s the official beginning of the annual shopping season, and I bet you have a lot of nephews and nieces and grandkids and kids on your lists! Paperbacks of Felix the Comet can be purchased from Lulu.com by clicking on the icon in the right sidebar of this webpage or any number of options of ebook versions for Kindle, Nook, iBook, and Kobo vendors, also in the right sidebar. I wish you a great Thanksgiving with loved ones, and happy shopping!! I have had a little luck with some sales here and there with Felix The Comet. I haven’t been doing much promo lately, but am working on a press release through my publisher, Lulu’s marketing team. So, I hope that when that comes out, I will see a jump in sales. The book has been selling steadily, but small. Meanwhile, the school year started, which always makes me a little busier with family things, making writing take a back step. As my kids settle back into a school year – 1st grade, sophomore in high school, and sophomore in college, very exciting times – I have opened up the old Nanowrimo I started about 4 years ago for Felix’s friend Kelsey’s adventure the following summer after sixth grade and everything that went down for Felix. I am finding that I don’t hate it nearly as much as I thought I would! Nano is not the most conducive way for me to write, but it is a good tool to keep up a daily writing practice especially when I need a jumpstart. I have really been enjoying reacquainting myself with Kelsey and the gang, and their families, from a new perspective. I am mostly in editing mode of what is already on paper, but am adding a bit here and there to change things up a bit from the rush job of Nano. I have the end of the book to write yet, though I do know what it looks like out there on the horizon, can’t wait to see it in better focus as I inch toward it. I continue to ask you all to spread the word about Felix the Comet as the, I know, I know, Holidays approach. I bet a number of kids, parents, and teachers in your lives would enjoy Felix as a stocking stuffer, Channukah present, or for whatever you celebrate. A little reminder: Felix is available from Lulu directly in paperback or ebook formats and for a wide variety of devices from Kindle to Nook, iBook and Independent sellers. And if you are a writer, too, I do recommended giving Nanowrimo a whirl this November. It can be loads of fun. I may even step back into it to work on Kelsey, though I may not follow the rules of the game completely. That part makes me a little nutty. Felix the Comet is springing up all over the internet in availability! I have added an array of widgets in my side bar to the right that will lead you directly to your device or site of choice!! Next Saturday, the 27th of September, I will be signing books at the Local Author Book Fair in Newport News, VA. Don’t miss it! I would be very happy to talk with you at my table. Click on the pic below to see more about Newport News Libraries. Felix the Comet has had a slow roll out of its debut on the paperback book and eBook markets. Some of this has to do with a late edit, and resubmission of the material process, and some is the nature of self-publishing. We just don’t have the same kind of advertising support without having to pay out of pocket as we might have if we had taken the standard publisher based route. Many of us are footing the business end of it ourselves, doing the nuts and bolts. I am not particularly good at this part of the business of writing. I think most writers who really respect their craft have a hard time pushing it into a wider sphere. The results of my survey are from talking mostly with other writers I have known over about twenty-five years, and somewhat from the myriad of blogs that address this very issue. Writers are not generally the most outgoing sorts, and tend to be pretty humble about their art, which is done largely in solitary and internally. We are not rock stars who love being on stage, though many of us do dream of New York Times best seller listings. Part of the success is the Art of Self-Promotion in the current world of Social Media. There are only so many Facebook posts, Google Plus posts, Tweets, and Retweets one person can do. It becomes daunting and I feel like I am overwhelming the small audience I personally know. For instance, recently, Felix is rolling out into wider distribution via Amazon for Kindle (click of the book cover picture above to get to the link in Amazon) and other venues, such as Nook, iBook and Kobo Books. I have tweeted and posted, and here I am posting what links are available so far here in my little blog. I guess this is my way of asking anyone who sees this if they would please share it, too. That way, I may start selling this little engine that could to a wider audience. I really do believe in my little book. I think it is a great one to have in schools, not just for kids read, but to have teachers, administrators, and parents read it, too. I would be incredibly grateful if you did. Meanwhile, a few people have read it, and some reviews are on Goodreads, and hidden behind an extra click on the Lulu pages for Paperback and in the eBook version from Lulu since the late edit. I would very much appreciate, that if you read it, you would add yours to the home pages and Goodreads, too. So far, all reviews are at a Five Star Rating!! So it isn’t just me who believes in Felix’s story. Thanks again for boosting the signal. Felix the Comet eBook is available! 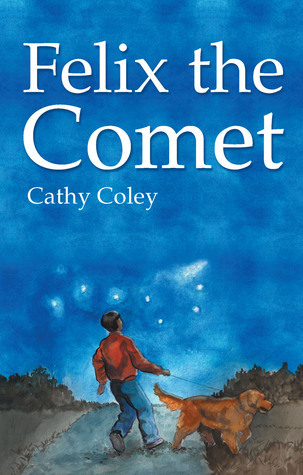 Felix the Comet is now available via Lulu.com in eBook format for only $8.99! Is your 9-12 year old due for a new book to fill summer hours? Get it now!! Soon the eBook of Felix will also be available via Amazon Kindle, iBook, Nook, Kobo and other distributors. But for now, it is exclusively available in Print and eBook from Lulu.com. I would really love it if you rated the book on Lulu, Goodreads, or a blog. If interested in blogging a review, please comment below. thank you!